After a strong episode last week, we remain at a constant high level with Bunker Hill. The return of Kevin Smith behind the camera is always a highlight to the calendar. 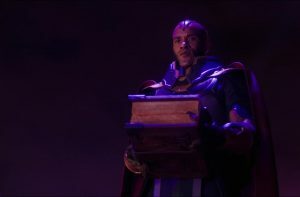 We didn’t get the fun, light-hearted episode crammed full of Smith Easter eggs unfortunately but we did get a dramatic, well written, well-constructed episode that left us begging for next week’s cross over. There is a heavy focus on Nia as we explore her so called narcolepsy in more depth. We witness her experiencing dreams and visions of Agent Liberty. 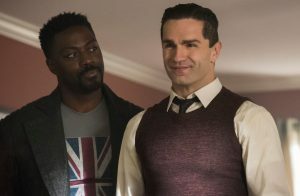 Kara and J’onn are on the hunt for Manchester Black after betraying Supergirl last week. Over at the DEO investigations are ongoing with the captured children of liberty. Brainy finally reveals that he is aware of Nia Nal from the 31st century but without harming the space time contingency cannot reveal the details. Ben Lockwood is seen having a conversation with someone that appears to be a superior. Ben is expressing his desire to stop being Agent Liberty for a while and let his new TV show address the mainstream public. It is obvious that Ben isn’t comfortable with the extreme methods of Agent Liberty. He thinks as Ben Lockwood he can appeal to more people in his war against aliens. The question here is who was Ben talking to? My gut is telling me Lex Luthor. Ben returns home to find his wife at the table having tea with Manchester Black. Manchester talks cryptically to Ben and his wife pretending to be a friend from college. This scene is a real stand out moment to highlight the amazing talent to have joined the show this season. David Ajala is the perfect on-screen presence for Manchester with his cool, calm but scary demeanor. Opposite that is Sam Witwer who as Ben Lockwood gives a fantastic display as someone who is always in control but having lost so much could snap at any minute. 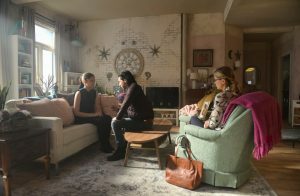 Kara visits Nia at her apartment and Nia confesses everything. She is an alien who comes from a line of women who have the genetic power to see the future AKA Dream Girl. Then we get the funniest moment of the episode, which once again goes to Brainy. He enters Nia’s apartment with so much swagger and falls flat on his face. Brainy helps Nia explore her vision to try and learn more about Agent Liberty. Kara, Nia and Brainy go searching for the woman in Nia’s vision in Collingwood which appears to be the Racist capital of America. They are very quickly kidnapped by children of liberty and we get a name drop we will hear more from during the cross over event. Nia says to Kara that getting kidnapped isn’t clever reporting and Kara says “Tell that to Lois Lane”. Unaware the children of liberty have captured Supergirl, Brainac 5 and Dream Girl it wasn’t hard to believe they would escape with ease. They discover Lockwood steal is the company behind the factory which appears to be a base of operations. Simultaneously Ben Lockwood reveals his Agent Liberty costume to his wife and Manchester. Manchester makes Ben put the suit on as he says “I want you to die doing what you love”. Just as Manchester is about to finish Ben, J’onn uses his mind powers to talk to Manchester and stop him. This gives Ben the opportunity to break free and run away, not even thinking about the safety of his wife who had just been threatened at gun point. What is that about? With the help of Alex, Supergirl confirms Ben Lockwood is Agent Liberty and sets of in pursuit of them. She arrives just in time to stop Manchester execute Ben. Manchester gets the better of Supergirl and covers her in liquid metal. While they debate their differing opinions on dealing with terrorists, Agent Liberty escapes. The images from Nia’s visions then come to fruition as Manchester is pointing a gun at Ben’s wife. Nia manages to stop Manchester just in the nick of time. 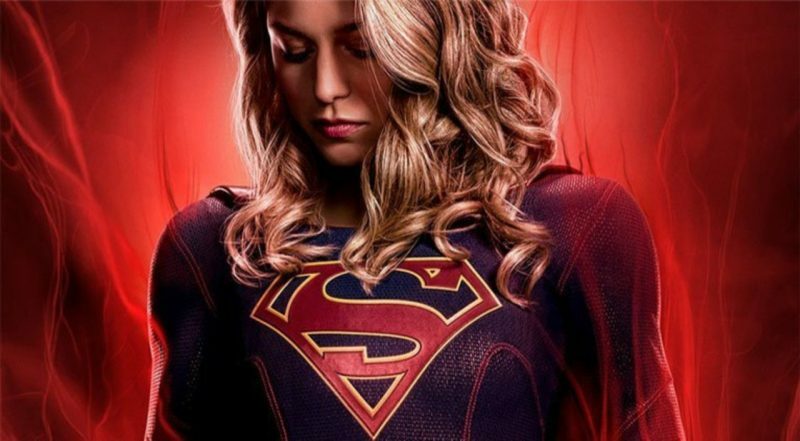 It takes Supergirl lifting the entire factory from its foundations to stop Ben Lockwood from killing an unconscious Manchester and save the day. Manchester Black and Ben Lockwood are taken away by the police as Ben gives an angry statement to the media quoting “you know who I am, who is Supergirl?” This gives me the impression we haven’t seen the last of the children of liberty or the hate crimes. There is also the unanswered question from the beginning of the episode, who was Ben talking to on the phone? I still stand by my original prediction that its Lex Luthor. The biggest shock was Supergirl is confronted by the President at the DEO. President Baker displaying his presidential qualities by caring more about polling numbers than the people. In doing this the president tells Supergirl she must reveal her true identity if she wants to continue working for the government. Supergirl refuses this and flies away leaving us wondering what she will do next. There is one more final treat as we see a glimpse of things to come in the crossover. Earth 90 is the location and it is a war-torn wasteland, littered with the bodies of countless fallen heroes. I see Star Girl, Ray, Captain Cold, Hawkman, Firestorm and many more. Finally, we see Jay Garrick Flash (John Wesley Shipp) being told “You did this to yourself now all of you will perish” by the Monitor. It would appear that The Flash manages to get to his feet and run away just in time to escape more devastation. That’s it for this week, a fantastic episode and arguably the best this season (so far). See you next week in Gotham. Let me know your thoughts below or on twitter.